The monsoon trough has further shifted northwards today. It is likely to shift further northwards along the foothills of the Himalayas and remain there during next 3­-4 days. The axis of monsoon trough at mean sea level now passes through Firozpur, Meerut, Lucknow, Muzaffarpur, Purnea, Guwahati and thence eastwards to east Nagaland. 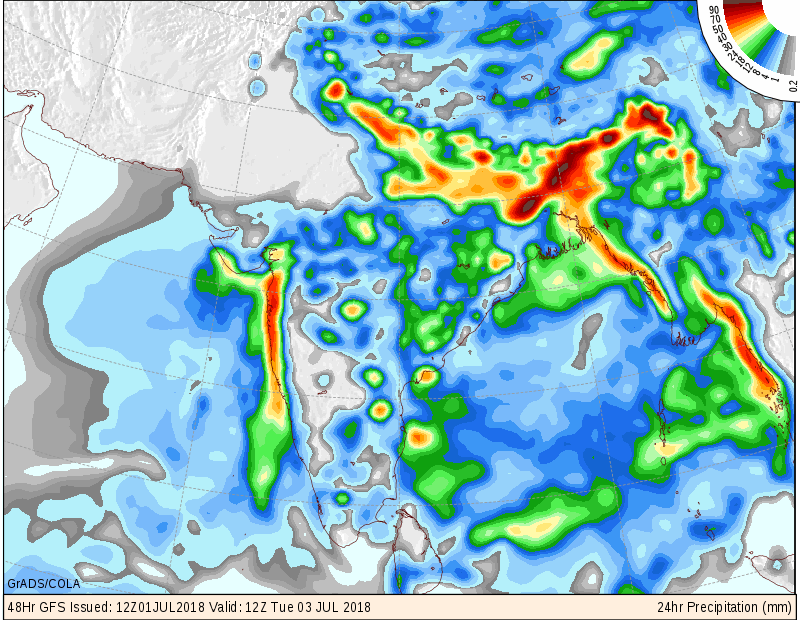 Consequently, rainfall activity is very likely to occur at most places with isolated heavy to very heavy falls over northern parts of Uttar Pradesh, Bihar, Punjab, Haryana & Chandigarh, Western Himalayan region and extremely heavy falls at isolated places over Sub-Himalayan West Bengal & Sikkim and north eastern states during next 3 days. The Western Disturbance as a trough in mid & upper tropospheric westerlies with its axis at 5.8 km above mean sea level now runs roughly along Long. 72°E to the north of Lat. 34°N. The UAC over Northeast Arabian Sea is now over North and adjoining Central Arabian Sea is now between 3.1 km & 5.8 km above mean sea level. The feeble off­-shore trough at mean sea level from South Maharashtra Coast to Lakshadweep area persists. Windy conditions expected on 3rd to 5th July over Saurashtra & Kutch. Humidity at 3.1 km over Saurashtra & Kutch will decrease on few days. 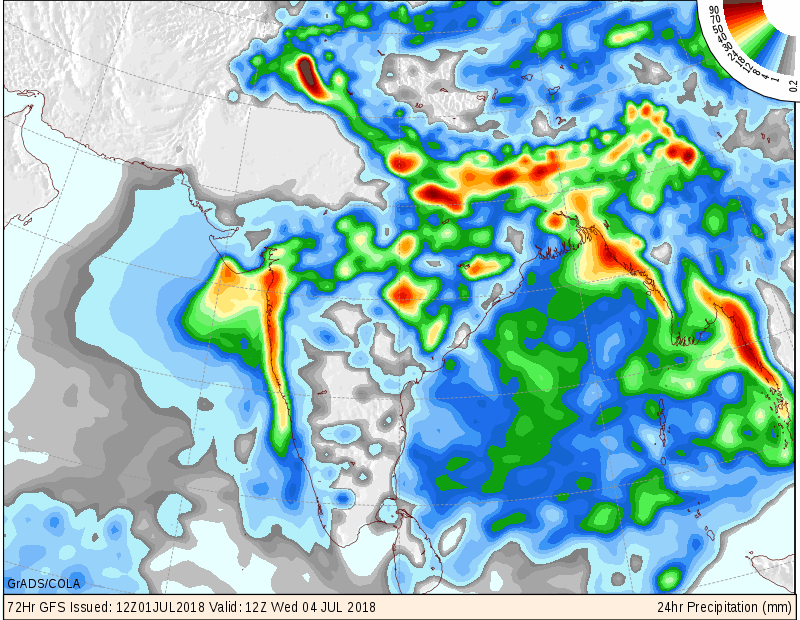 South Gujarat expected to receive scattered to fairly widespread light/medium/heavy rain on some days days of the forecast period. Rain quantum decreasing moving Northwards over the area. Central Gujarat expected to receive scattered light/medium rain on few/some days of forecast period. More chances over Gujarat/M.P. and adjoining Rajasthan border areas. 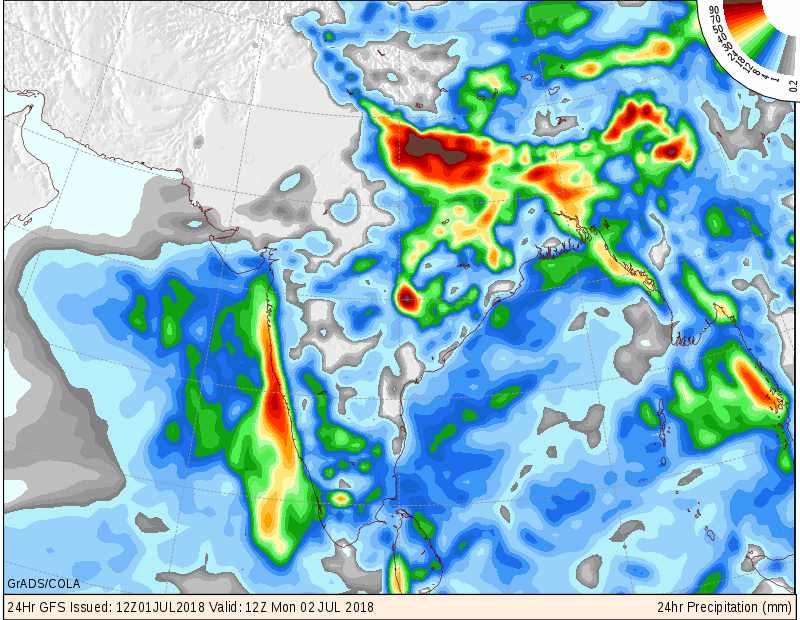 North Gujarat expected to receive scattered showers/ light rain on few/some days of the forecast period. Saurashtra & Kutch expected to receive Scattered showers/light rain on few/some days of forecast period with more chances along Coastal Saurashtra. Note: Central Gujarat, North Gujarat, Saurashtra/Kutch rainfall coverage is scattered. 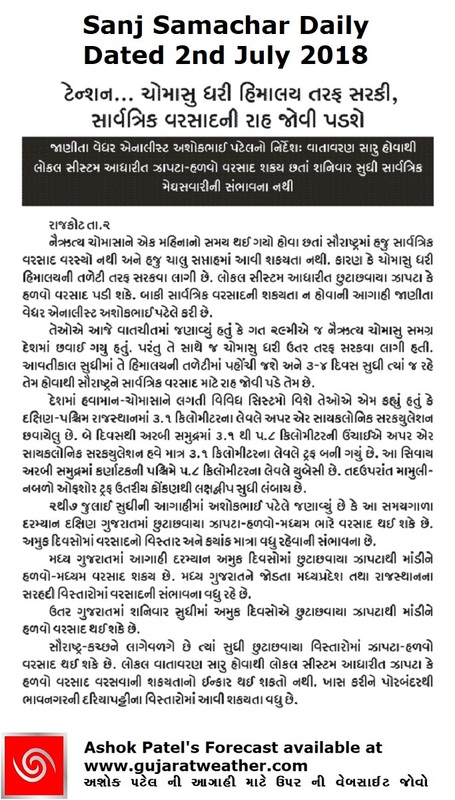 Saurashtra/Kutch and areas without rain should refrain from sowing in dry fields. ચોમાસુ ધરી હિમાલય ની તળેટી તરફ સરકે છે અને ત્યાર બાદ તે બાજુ 3-4 દિવસ રહેશે. હાલ ચોમાસુ ધરી ફિરોઝપુર, મિરત, પૂરણયા ,ગૌહાટી અને ત્યાં થી નાગાલેન્ડ તરફ જાય છે. વેરસ્ટર્ન ડિસ્ટર્બન્સ ટ્રફ તરીકે મીડ અને અપર ટ્રોપોસફ્યરિક પશ્ચિમી પવનો જે 5.8 કિમિ ના લેવલ માં Long. 72°E અને Lat. 34°N. થી ઉત્તરે છે. અરબી સમુદ્ર વાળું યુએસી થોડું દક્ષિણ પશ્ચિમે ખસ્યું અને હાલ નોર્થ અને લાગુ સેન્ટ્રલ અરબી સમુદ્ર ઉપર છે જે 3.1 કિમિ થી 5.8 કિમિ સુધી ફેલાયેલ છે. એક મામૂલી ઑફ શોર ટ્રફ દક્ષિણ કોંકણ થી લક્ષદ્વીપ સુધી લંબાય છે. 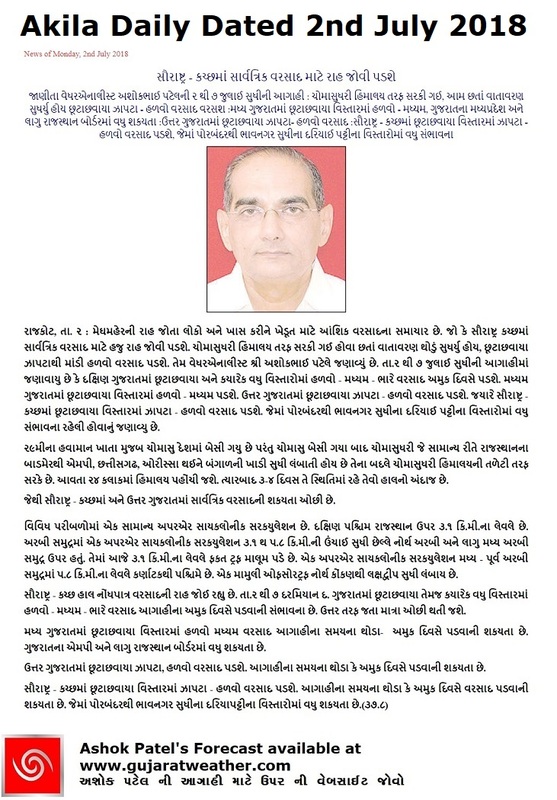 સૌરાષ્ટ્ર અને કચ્છ માં તારીખ 3, 4, 5 દરમિયાન પવન વધુ રહેશે. સૌરાષ્ટ્ર અને કચ્છ માં 3.1 કિમિ માં આગાહી ના અમૂક દિવસે ભેજ ઓછો છે. દક્ષિણ ગુજરાત માં છુટા છવાયા તેમજ ક્યારેક વધુ વિસ્તાર માં હળવો/મધ્યમ/ભારે વરસાદ આગાહી સમય ના અમૂક દિવસો પડવાની શક્યતા છે. તે વિસ્તાર માં નોર્થ તરફ જતા માત્રા ઓછી થતી જણાય. મધ્ય ગુજરાત માં છુટા છવાયા વિસ્તાર માં હળવો/મધ્યમ વરસાદ આગાહી સમય ના થોડા/અમૂક દિવસો પડવાની શક્યતા છે. ગુજરાત ના એમપી અને લાગુ રાજસ્થાન બોર્ડર વિસ્તાર માં વધુ શક્યતા. નોર્થ ગુજરાત માં છુટા છવાયા વિસ્તાર માં ઝાપટા/હળવો વરસાદ આગાહી સમય ના થોડા/અમૂક દિવસો પડવાની શક્યતા છે. સૌરાષ્ટ્ર તથા કચ્છ માં છુટા છવાયા વિસ્તાર માં ઝાપટા/હળવો વરસાદ આગાહી સમય ના થોડા/અમૂક દિવસો પડવાની શક્યતા છે જેમાં કોસ્ટલ સૌરાષ્ટ્ર (પોરબંદર થી ભાવનગર સુધી ના દરિયા નજીક વિસ્તારો ) વારો વધુ આવે તેવી શક્યતા. મધ્ય ગુજરાત, નોર્થ ગુજરાત, સૌરાષ્ટ્ર અને કચ્છ માં છુટા છવાયા વિસ્તારો ની વાત છે. આ આગાહી ઉપર મદાર રાખી ને કોરા માં વાવવું નહિ. Sachu email address hoy toe comment ma majaa avashe ! Jsk.Sir.Akila ma update aavi gai che.Mitro vanchi lejo badha.